Back in 2009, T.S. 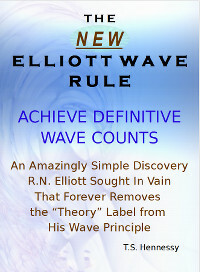 Henessy from NewElliottWaveRule.org has written a free e-book titled The New Elliott Wave Rule — Achieve Definitive Wave Counts. It can now be considered a must-read book for those traders who employ Elliott Wave patterns in their analysis (in Forex and in other financials). Since the book is offered for free, I have decided to read it myself and to share it with my blog’s visitors. It should be said that I am not a fan of Elliott Wave theory. To me, it looks too subjective and “unaccountable”. That does not mean that I am oppose it or deem any EW practitioner a crackpot. No, we even have an Elliott Wave video section on EarnForex.com, but this method of technical analysis is not my cup of tea. I had read the e-book anyway and it did not change my opinion about Elliott Waves. Basically, the e-book adds one important rule to Elliott Wave counting process, which makes it possible to remove such things as Extensions or “crazy waves” from the traditional model. Henessy just states that some waves will contain other waves (on more detailed timeframe) that will break through traditionally expected price range. He explains it all in details, so you need to actually read the book if you need more information. This allows more accurate count and less errors with locating the current wave. A tradeoff is that you will need more detailed data-feeds (charts) with 15 timeframes optimally. The New Elliott Wave Rule is not a book for beginners. It will not teach you to count waves or any other basics of Elliott Waves. However, it will help an experienced practitioner of the EW theory to improve his skills and understanding. One of the disadvantages (that I find inherent to all books on Elliott Waves) is that it shows all examples on rather simple and completed charts. I would like to see some demonstration in progress, where waves are counted as new bars appear. Unfortunately, I will probably need to wait until some powerful automated Elliott Wave detection software becomes available to see something like this. If you have any questions, comments or opinions regarding The New Elliott Wave Rule by T.S. Henessy, please feel free to post them using the commentary form below.